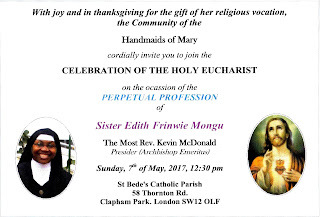 Next Sunday – Final Profession of Sister Edith: This parish is amazingly graced to have the final profession of a young Sister. This is a rare occasion especially in England and many Catholics have never been to a profession. Now is your chance – next Sunday at 12.30pm, Archbishop (Emeritus) Kevin will come and preside. Sister will make her vows to Mother Provincial from Madrid who represents the religious congregation of the Handmaids of Mary and the Archbishop, representing the Church will bless and present her with a ring symbolising her bridal status with Our Lord. Special Sunday - 11am Today: The music for this Mass will be: Ordinary - Missa Ave maris stella (Tomas Luis de Victoria); Offertory - Ave maris stella (Tomas Luis de Victoria); Communion - Benedicam Dominum (Orlandus Lassus); After Last Gospel - Regina caeli (Francisco Guerrero). Music provided by Cantores Missæ under the direction of Charles Finch. The next Special Sunday will be 21st May. Fr Pawel: is on his Easter break in Poland. Confirmation Trip - Bank Holiday Monday: Please meet at Clapham South tube at 10.15am with packed lunch. If your zip / oyster card is too low to go to London, top it up before 10.15. We should be back before 7pm. Fri 5th: 9.30am Recollection for Ladies. 3.45pm First Friday Polish Mass. Sat 6th: 5pm Monthly prayer group (Convent). 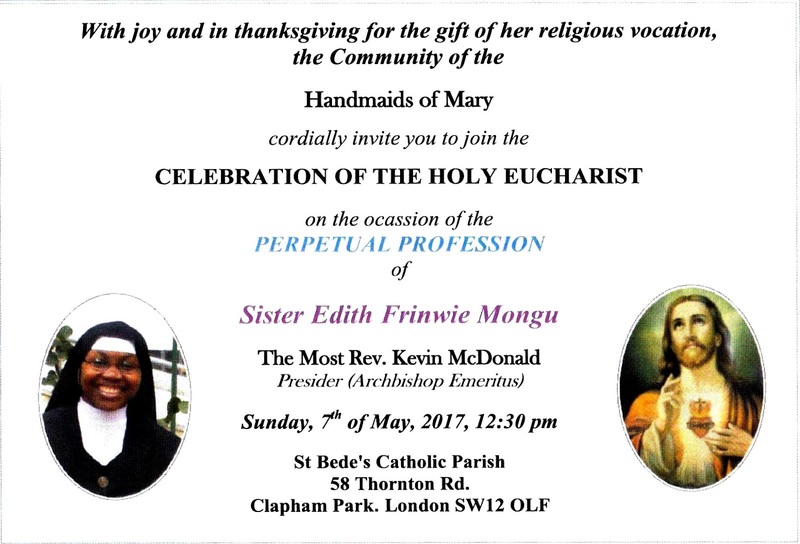 Sun 7th: 12.30pm Final Profession of Sister Edith. Sun 14th: Let the Children Appeal. 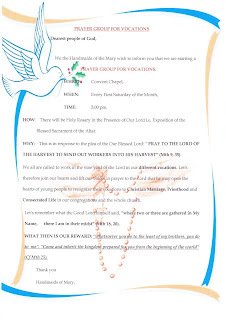 Tues 16th: 10am May Procession - St Bernadette. 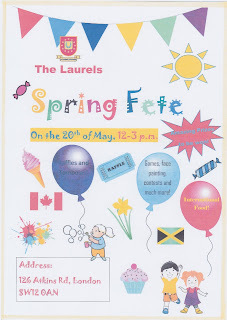 Sat 20th: 12-3pm The Laurels Spring Fete. Sun 4th: 12.30pm Memorial Mass for Canon Charles Williams. Sat 24th 6pm Reunion Mass for FHC. Sun 25th 3pm Corpus Christi Procession. Annual Marriage Mass at the Cathedral in June: Apologies – the form to apply for the annual Mass for those of you who are celebrating 1st/10th/25th/40th/ 50th/ 60+ wedding anniversary this year, is now at the back of Church. 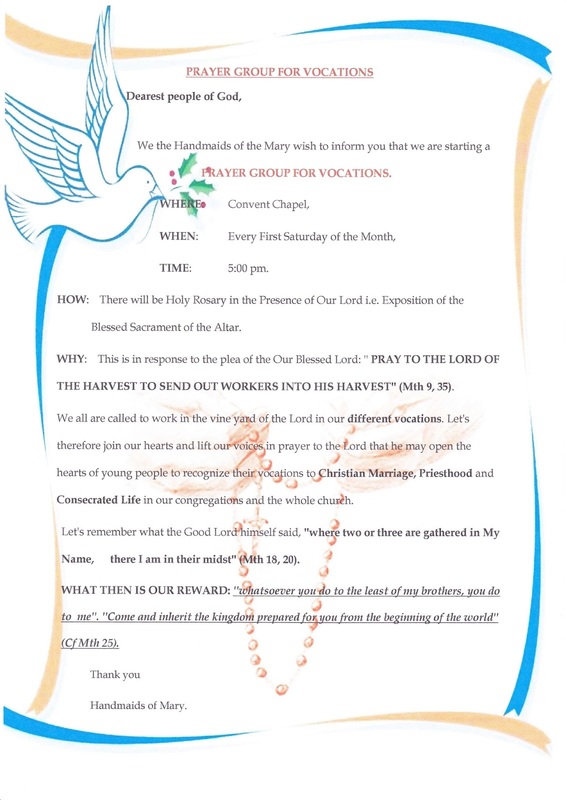 Please write very clearly so you can receive an invitation from the Archbishop. The deadline should be today however we have asked if we can have a few more days. May Procession Here: To celebrate the 100th anniversary of Our Lady of Fatima; the May procession will take place on Saturday 13th May at 10am. We will leave St Bede’s and go to the convent where we will bless their statue and process back towards the church. There will be a shared lunch in the club afterwards. The Laurels Spring Fete: Saturday 20th May 12-3pm. There will be raffles, tombola (for adults & children), games, face printing & international food (always a very popular area!!). Monthly Prayer Group at Convent: Next Saturday at 5pm in the convent Chapel. There will be Rosary and Exposition of the Blessed Sacrament. Welcome to God's Church: Stephanie Annabelle Bile, daughter of Stephen & Franca baptised last weekend by Fr Christopher. Cleaners for this week: Annie Nongo, Biannie Bilwala & Mamie Bakakana. St Elisabeth Convent (Minsk, Belarus) Monastic Choir Concerts: Wednesday 3rd to Sunday 7th May at various locations within London. There will be chants and songs and after the concert there is a special exhibit from the workshop of St Elisabeth Convent. Please see the poster in the Porch for more information.